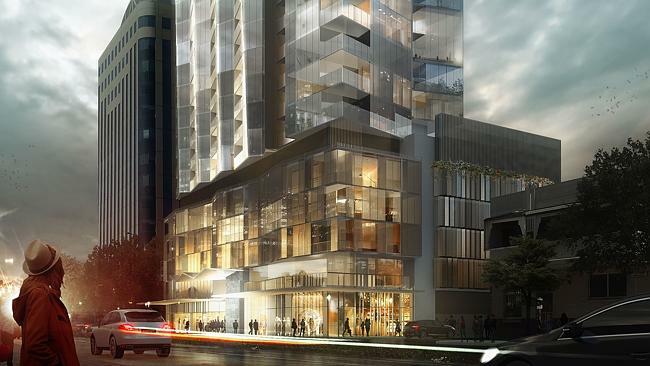 WORK on Adelaide’s tallest residential building will begin by the middle of year and plans for the city’s first eco-hotel have also been given the green light. The Development Assessment Commission has approved Asian Pacific Group’s application for an 85m tall, 27-storey apartment tower at the southern end of King William St.
A 21-level glass wall tower will sit above a five-level podium with a rooftop garden and recreation centre on the sixth floor. Asian Pacific Group CEO Will Deague said marketing will begin in May and site works in July. “Buyers will be encouraged to walk, cycle or use public transport and will be attracted by its location right on the tramline, making it easy to commute to work in the CBD or head to the beach at Glenelg,” Mr Deague said. TELL US: What do you think of the plans? A joint venture with Starfish Developments, Vue on King William is Asian Pacific Group’s second Adelaide project following the Watson Hotel and Apartments at Walkerville. The Commission also approved Troppo Architects’ plans for a nine-story eco-hotel facing Whitmore Square. The non-airconditioned Hotel Ivaritji would honour a revered Kaurna ancestor and have a cafe and basement gallery space. Troppo director Phil Harris said the hotel would help kickstart a transformation of the area into “the Greenwich Village of Adelaide”, but could not say how soon construction would begin. “We think bringing (environmentally conscious) visitors to the square fits with the whole market precinct and the slightly bohemian character of the whole southwest corner,” he said. Adelaide City Council opposed the application because it requires the demolition of two 1895 villas, but Mr Harris said “common sense” had prevailed because the highly modified buildings were of no heritage value. The Commission this week deferred consideration of an application for a 110m, 32-storey hotel and residential tower on Currie St that would be Adelaide’s second tallest building. A decision on a bid for a 19-level development on North Tce, including the revival of the 1878 G & R Wills warehouse building into a high end retail centre, was also deferred.